With a span of nine counties and 8,300 square miles, 40 churches are part of the Bi-Fork Baptist Association in the rolling plains of West Texas. Throughout the vast expansion of land, Robert Wheat, the director of missions for the association, wanted the churches to have a mobile resource to reach people in need of the Gospel. After months of dreaming, Wheat envisioned a ‘Life Trailer’ that was mobile and versatile for churches to utilize in reaching their communities. After applying for a grant from the Mary Hill Davis Offering, Wheat received $9,000 along with another $11,000 from donations by the association. The total amount afforded for a brand new trailer plus items for entertainment: a bounce house, a popcorn machine, a snow cone machine with nine flavors, a portable sound system, a canopy for shade, four 6-foot tables and 24 chairs. The grant from the Mary Hill Davis Offering fulfilled Wheat’s dream. He purchased a 30-foot long trailer with the Bi-Fork Baptist Association logo painted on it. Pastors within the association were now capable of incorporating what they called the ‘Life Trailer’ for reaching the lost and the broken. Pastor Smith hopes to use the Life Trailer again in September for an underprivileged neighborhood. By using the Life Trailer, he hopes to host a block party as a way to gather the children and their parents for popcorn, snow cones, bounce houses and a Bible study. 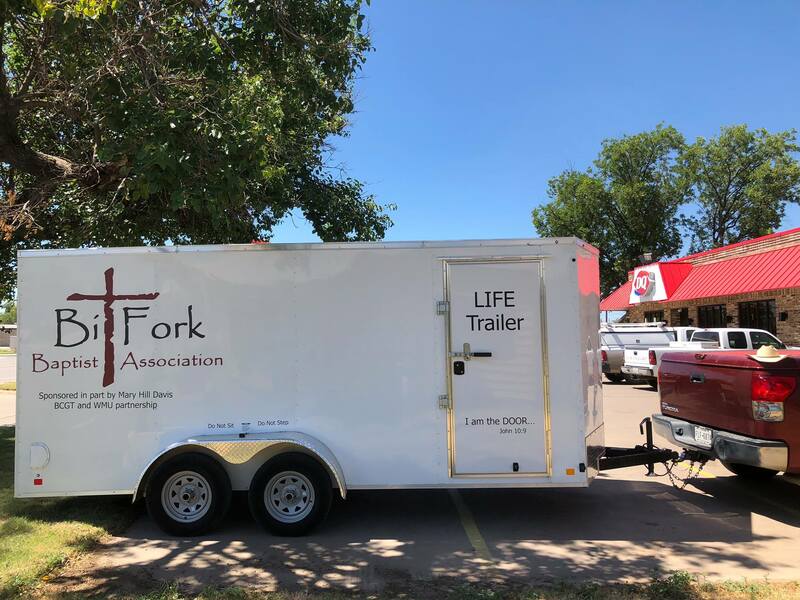 Another church in the Bi-Fork Baptist Association is also making use of the Life Trailer. NewLife Baptist Church of Vernon requested the Life Trailer to host an event for a low-income housing complex called, "Bounce Back". Members of NewLife Baptist Church desired to take the Gospel to places in their city where Christ was essentially unknown. In fact, the low-income housing complex was relatively untouched by the Gospel before NewLife Baptist Church hosted the event. According to Pastor Christopher Whitney, NewLife was able to offer the families living in the complex the love of Christ. Through the Life Trailer, the church built relationships and shared the Gospel with over 30 people who were not saved. During the event, one man accepted Christ as his Savior. Under Wheat’s leadership and vision, the Bi-Fork Baptist Association is prepared and ready to affect change in their communities. With the financial aid of the Mary Hill Davis Offering, churches eager to share the Gospel can utilize the trailer in their communities. This ministry is made possible by gifts made to the Mary Hill Davis Offering. . The Mary Hill Davis Offering Week of Prayer is September 9-16, 2018. Click here to find out more about the Mary Hill Davis Offering.